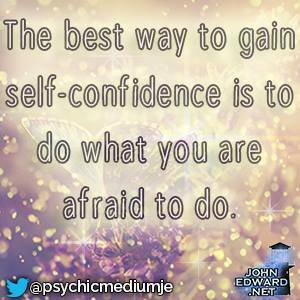 Have you ever wondered if confident people are born that way or if they had a secret pill to overcome their fears? Well, I wanted the magic pill. I wanted to feel confident. I wanted to walk into a room of people that I didn’t know and not secretly worry if someone would talk to me. I wanted to wave the magic wand to guarantee my confidence and success. When I first started in direct sales, I was “Belinda‘s mom”, “Joan’s daughter”, “Rob’s fiancé”, “Bob’s daughter”, the boss, and who knows how many more titles. I was never really Hope – the person. To be honest, I had confidence wearing one of those hats but when it came to being ME, I was clueless. Does this sound like you? Answer yes or no to each of these questions. There are NO right or wrong answer, and no score. Do I compare myself to others who are more successful or luckier than I am? Do I tend to aim extremely high? Do I feel better when I do things within my comfort zone? Can I explain why I have stumbling blocks to my confidence and success? 1. Don’t compare yourself to others. This one has been tough for me. I am learning to NOT compare myself to others who I view as more successful BUT to learn from them. Comparison used to be a way to be beat myself up for not being good at something, now it is what sparks my motivation. 2. Dream big, set your goals high but not out of reach. Remember that they are YOUR goals. Success often requires a mix of medium and big dreams. Don’t aim so low that you never challenge yourself. When we aim low, our success doesn’t really make us feel good about ourself. This feeds our insecurities so get out of your comfort zone. 3. Get started! Do something! Taking just one step can kick-start your progress. Begin each day with something doable. Don’t just make lists, do something on your list. I am a great one for lists but now I am actually scratching things off that I accomplish. Success in small dose is a great confidence builder. 4. Know your emotional triggers. I have a bad habit of staying in the dark letting Negative Nellie or Doubtful Debbie have a field day in my head. Now I recognize the negative words or actions that hit those “buttons”. Once I see the negative, I hit the RESET button. I replace the negative with positives that will contribute to my success. This one takes practice but it can be done. Has someone ever told you “I want to be like you”? If so, hold onto that because when you begin to see yourself as others do – your confidence will grow.